Whether you prefer strolling around taking in world-famous art, examining thought-provoking historical exhibits or learning about space at a planetarium, museums offer great ways to spend a day. You can create a fun, dinosaur-filled day for kids, show off your local art or history to visiting extended family, or even turn a day at the museum into a fun date. However, visiting a museum often isn’t cheap — unless you know when to go. Did you know many museums offer free admission days and times? Use these discount days and deals to visit your favorite museum or check out a new one, all for free. Of course, many museums rely on admission fees and donations to keep their doors open, so it’s always nice to donate when you can. But don’t let a tight budget keep you from enjoying a trip to a world-famous institution or a visit to the local historical exhibits. Here’s how to visit museums for free. Where Can You Find Free Museums? Even world-class museums are willing to throw open their doors and welcome people for free. While this is a small list of options, check whether your hometown museums offer free days by searching for “free museum days” plus your city. You might be surprised with what you find. Be sure to double check before you go to make sure the offer is available when you’re planning to visit; some museums offer free admission only at certain times or only for certain exhibits. The national’s capital city is packed with free museums. 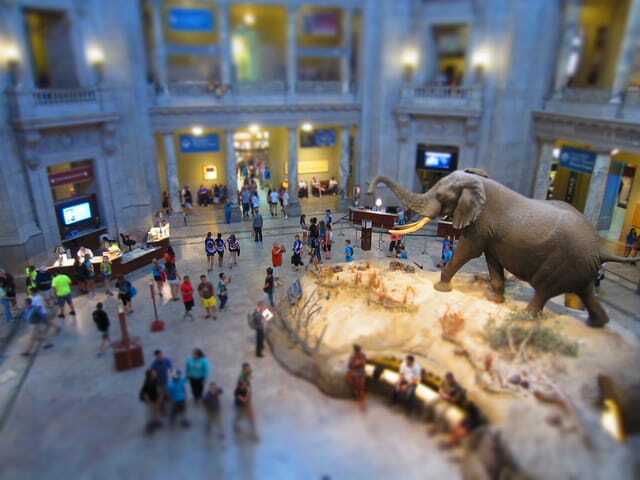 The Smithsonian Museums and the National Zoo are always free to visitors. Check out the National Portrait Gallery to scope out some famous faces, delve into dinosaurs at the National Museum of Natural History or check out one of the many other free Smithsonian museums in the city. New York is packed with world-renowned museums, many of which are free to the public. Over 15 museums are always free to the public, including The Bronx Museum of Arts, Federal Hall National Memorial, Irish Hunger Memorial, The Museum of the Fashion Institute of Technology and more. Many others offer free admission on certain dates and times, including The Brooklyn Botanic Garden, Bronx Zoo, Brooklyn Children’s Museum, Museum of Modern Art and many, many more. Check here for a full list of when to head over to your favorite museums for free. This bustling Texas city boasts 10 different museums that are always free, including the Houston Center for Photography, Asia Society Texas Center, Contemporary Arts Museum Houston and more. Other museums, including the Buffalo Soldiers National Museum, Children’s Museum of Houston and The Museum of Fine Arts, Houston, have select “free” times and dates. Check here for a detailed list. Many of Chicago’s museums are free to Illinois residents during certain times. For a detailed list of free 2015 dates for Chicago museums, check here. Listed museums include the Museum of Science and Industry, Field Museum, Shedd Aquarium, Chicago History Museum and a variety of other museums throughout the city. Most of these deals are only available to Illinois residents, but some, such as the Swedish American Museum, Loyola Museum of Art and Dusable Museum of African American History, have days when everyone gets free admission — so if you’re visiting from out of town, you might want to plan around these dates. Chicago’s Adler Planetarium offers free admission days for Illinois residents several times a year. The next dates are June 3-5 and June 10-12. These dates are subject to change, though, so check back for updates. You’ll need to show an ID with an Illinois address to receive your free admission. Planetarium shows and special exhibits may still cost money. Can You Get In for Free? While some museums are open for free to everyone, some only offer free admission to certain groups of people. Answer the questions below to see if you may be eligible for free or reduced price admission at a variety of different museums. Many city- and state-sponsored museums offer free admission to residents of those cities and states. For example, many Chicago museums offer free admission to Illinois residents and the Adler Planetarium offers special deals for Chicago city residents. Check whether your local museums do the same! Are You Involved in Education? Museums are places of learning, so of course it makes sense to offer special deals (and often free admission) to teachers and students. Be sure to bring a current school ID to take advantage of any special teacher and student deals. Current and former service members receive free admission or discounts to many museums. These discounts are often valid every day of the year, but check with the museum you want to visit to be sure. Be sure to bring your military ID. Are You a Member of Any Museum? If so, you may be eligible for free or reduced price admission to partner museums. Joining a museum in one network often makes you eligible for free admission to dozens or even hundreds of other museums in the same network. And they’re not always local. These networks often include museums throughout the country and sometimes even overseas. If you’re considering becoming a museum member, be sure to ask about partnership agreements with other museums. Your Turn: What’s your favorite museum to visit for free?